And you never know who or what you’ll come across, as Nha Trang attracts a diverse mix of people, from scruffy budget travellers to those dressed to the nines. Nha Trang has a reputation for nightlife, though it is surprisingly limited as most bars and clubs popular with tourists are compactly found within the tourist centre and people tend to end up at the same few places that are opened past midnight, including Sailing Club Nha Trang mentioned above. The bars feel alike, with cheap booze luring backpackers, and a quick walk around will reveal which bar has the happening vibe du jour. And you never know who or what you’ll come across, as Nha Trang attracts a diverse mix of people, from scruffy budget travellers to those dressed to the nines. With nightlife comes those who prey on unguarded and inebriated tourists. Crimes range from petty theft like pickpocketing and bag snatching to more serious and physical threats from men, women or men dressed as women. If a bar looks dodgy, it probably is. Most of the following advice is just common sense: don’t carry valuables or large amounts of cash, secure your wallet, watch your drink, don’t wear expensive jewellery or watches, avoid being alone on the beach at night and don’t expect to find your wallet after you’ve passed out drunk. Opened in 2015, Skylight: 360 Sky Deck and Rooftop Beach Club gives guests a 360-degree view of the city and the bay from the 43rd floor of the Best Western Premier Havana. The view is impressive and unparalleled. Access to the Sky Deck costs 100,000 VND and that includes a welcome drink. A rooftop beach night club is set to open in 2015. Never trust a bar that poses a question to entice you away from your better judgement. Why Not Bar? openly declares its questionable existence but at least you know what you are getting yourself into: cheap bucket drinks with cheap alcohol, shady staff, pickpockets and a lively mob – this joint is always jam-packed by the time the sun goes down, which is why we’ve included it. Online reviews of this place are delightful: “I can give you a thousand reasons why not!” “Awful complete dump” and “Why not close this place down?” It is what it is. Be warned. Booze Cruise Sports Bar & Grill has a flatscreen just about everywhere you turn so patrons can catch the game. As the name suggests, this isn’t the most refined place or a place you’d take the kids, but the crowd is just loud and obnoxious, not wild. There’s mediocre pub grub, some live music nights and yes, plenty of booze: draught beer, drinking games, buckets and happy hour. Ana Beach House: Tran Phu Blvd at Evason Ana Mandara; T: (058) 2244 809; open daily 08:00-22:30. 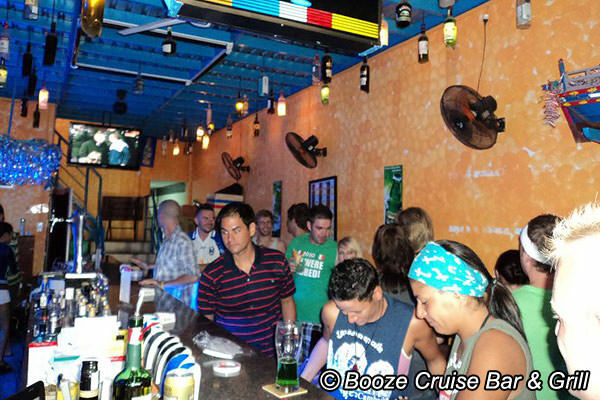 Booze Cruise Sports Bar &Grill: 110 Nguyen Thien Thuat; T: 905 719 519; open daily 06:00-03:00. Da Fernando: 96 Nguyen Thien Thuat St, south of Biet Thu St; T: (058) 352 8034; open daily 10:30-22:30. Ganesh: 82 Nguyen Thien Thuat St; T: (058) 352 6776; open daily 11:00-22:00. Goc Ha Noi: 142 Bach Dang, at To Hien Thanh; T: (058) 3511 522; 06:00-22:00. Lac Canh Restaurant: 44 Nguyen Binh Kiem St; T: (058) 821 391; open daily 09:30-21:30. La Casserole: Bien Thu 36; T: (0125) 771 7173; open Mon-Sat 10:00-15:00 &17:00-23:00. Lang Chai Hai San Dai Duong: 10 Pham Van Dong St; T: 0903 582 876. Lanterns: 34/6 Nguyen Thien Thuat St; T: (058) 2471 674; open 07:00-22:30. Louisiane Brewhouse and Restaurant: Lot 29, Tran Phu; T: (058) 3521 948; open 07:00-01:00. Ngoc Tien: 59 Le Thanh Phuong, south of Yersin St; T: (058) 381 0482; open 10:00-22:00. Pita GR Restaurant: 7G4 Hung Vuong St, between Biet Thu and Tran Quang Khai St; T: (0162) 770 6852; open daily 11:00-22:00; khv-since@yandex.ru. 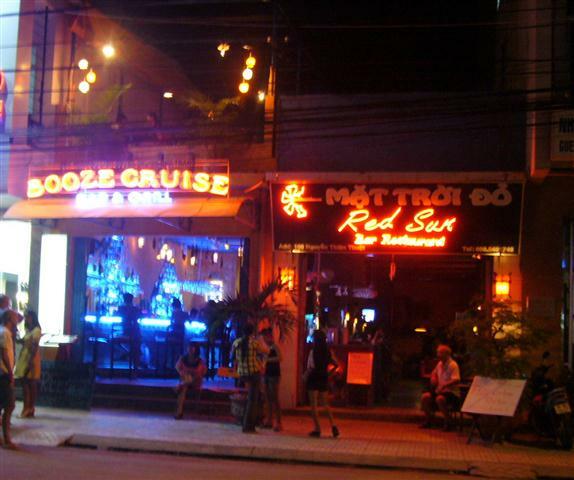 Sailing Club Nha Trang: 72-74 Tran Phu St, southern end of downtown core; T: (058) 352 4628;; open daily 07:00-02:00. Why Not Bar: 24 Tran Quang Khai St; T: (058) 3522 652; open until 04:00.